9/1/13: PHOTOS: Thank you to Tony Jewell for being on course and taking photos on race day! Following is a link to what’s been uploaded so far: Photo Link Enjoy! 9/1/13: Thank you to everyone who participated in the 2013 Grand Teton Races, especially all of our incredible volunteers! We hope you enjoyed your day at Grand Targhee Resort. Results will be posted as soon as possible…we’re trying to work out a file sharing issues and/or get the new version of UltraSignup software working! 8/30/12: It’s almost game day! Recent rains have reduced the dust on the trails, which are in great shape! And, the weather for Saturday looks great, if not a bit on the warm side. Be sure to hydrate and pace accordingly. Packet pickup is in Driggs at Dreamchasers (47 South Main St) from 2-7pm. A short race briefing will take place at 5pm, in the fitness space behind the Dreamchaser shop. See you all soon! 8/28/13: Bib numbers for the 50KM race have been assigned. CLICK HERE to view. Marathon numbers will be assigned on Thursday (late afternoon or early evening) and the 10KM numbers will be assigned on Friday morning. Actual race bib numbers will not be handed out until race morning (so we know who has checked in and is on the course). 8/28/13: We forgot to mention that all course maps (50KM, Marathon, 10km) are available on the MAPS page on the race website. If using Firefox and you receive a strange message regarding the Adobe Acrobat file, look to the top of the page and it should offer an option to open in another format. Be aware that the Elevation Profile is only meant to give an overview of the courses and is not exact. 8/28/13: Snake River Brewing is once again providing participants with with post-race adult beverages. Must be 21 to enjoy their locally brewed beers..and if you’re passing thru Jackson Hole, be sure to stop in and check out their Brew Pub! Thank you! 8/27/13: As of tonight, all three sections of the course have been flagged with our tri-color ribbon. The main junctions will receive more signage (arrows, wrong-way signs, etc.) on Friday. So if you are out scouting the course, please keep in mind that the major directional signs don’t go out until late in the day on Friday as the Resort sees a lot of hiking, biking and horse traffic throughout the week. 8/23/13: The new 50km map has been posted to the Maps page. It can be found HERE. The revised elevation profile, along with the new Trail Marathon Map, should be available late Sunday. We’ve had rain in the Tetons the past two days, which will hopefully keep up for a few days as the trails are quite dusty. Still, the skies have been clean when the rain subsides and the smoke has stayed away. Fingers crossed for ideal weather next weekend. 8/21/13: While sections of Idaho are experiencing wildfires, the smoke in and around Teton isn’t too bad. Some days are better than others, but for the most part we have been able to clearly see Grand Targhee Resort, and the Grand Teton, from Driggs, ID. The forecast calls for some rain over the next few days, which will be welcome after such a hot and dry summer. The 50KM, Marathon and 10KM races will be run rain or shine (or snow or smoke). 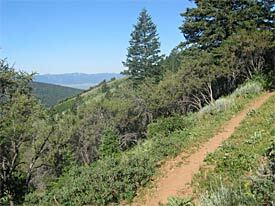 The 2013 courses have seen many changes (and some trails are still being cut at Grand Targhee Resort). With that, cut off times for certain aid stations have been altered, so be sure to make a note of those. The course maps are being finalized and will be posted as they become available. Rest assured that the trails will be marked extremely well (but you will need to do your part to be alert at any junction) and the furthest distance between stations will be 4.1 miles. Always remember that you’ll be running at altitude so be sure to monitor your hydration throughout the day. Please note, the Wydaho Mountain Bike Rendezvous Festival will be taking place over Labor Day weekend, so there may be more bikers than normal on the trails utilized during the race. We operate under a special use permit from the USFS and the trails, which are multi-use (foot, bike, horses) are open to the public at all times during the event. Please be courteous to others who might be out enjoying a day in the mountains. Feel free to bring a friend or two along to enjoy the other options available at Grand Targhee and Teton Valley! All participants, in all events, must check-in before starting their event on Saturday morning. We need to know who’s on the trail in order to run a safe event. If you do not check in, we cannot provide you with an official finishing time. Thank you for your cooperation! Be aware that wildlife could be present anywhere on the course and that carrying bear spray (and knowing how to use it) is a wise decision, especially in the early morning and late afternoon/evening hours. It is also a good idea to make some noise if running alone so unsuspecting animals are not startled. The weather forecast will most likely be dry, but it could rain or sleet or snow…be prepared for everything here in the Tetons. Should lightning storms present safety issues for our volunteers, they may be forced to seek shelter inside a car, camper of ski lift hut. This is especially true of the aid station at the top of the course, on Fred’s mountain. Participants will be strongly advised to stop and wait out the storm but are welcome to continue on the course, knowing that they are continuing at their own risk and that aid station personnel might not be present due to safety issues. We are happy to once again offer Hammer HEED (orange) as our electrolyte replacement drink on the course, as well as sodas (Coke, Mountain Dew, Ginger Ale), at all four of the fully stocked aid stations. Additionally, water will be available at those four stations, as well as the 2 self-service aid stations on the course. (The 10K will have only one, self-service water station on the course so it’s wise to carry fluids.) Please remember that ALL runners in ALL races MUST carry a water bottle or hydration pack while participating in the Grand Teton Races. Aid station food (at full service stations, except Cold Springs) will include: Hammer Gels (mixed flavors), Tram Bar pieces, chips, pretzels, candy (m&ms, snickers, etc), bananas, oranges, sandwiches (PB&J, turkey), potatoes, cookies, soup (at the Base and Teton Canyon stations only), jerky and other items throughout the day. We WILL provide food at all of the ‘staffed’ aid stations on the course: Fred’s, Base (a.k.a. Main), Ski Hill-Lower and Cold Springs (with limited food selection here due to bear habitat concerns). Additionally, Endurolytes, sunscreen and bug spray will be available. Drops bags being sent down to the SKI HILL ROAD – LOWER Aid Station (AS #4) must not contain any open food items, as the Forest Service will consider these ‘food stashes” and halt the race if they are found. We will do our best to stock this lower aid station with food that is easily contained, stored and monitored by the Aid Station personnel. They must be dropped on the Plaza (look for the sign by the rock climbing tower) by 6:15am. NO RACE DAY REGISTRATION (for the ‘adult’ races): Registration for the Kids’ Race will take place on the plaza around 10:15am. The Grand Teton Races are not like a big city marathon. They are held on US Forest Service trails which require a permit for activities. Part of our permit requirement is that no litter will be found on the trails during or after the event. We do not have street sweepers cleaning up after us. Trash boxes will be placed about 100 yards from each station (when possible) so please use them. Please do not leave cups, gel wrappers, clothing or other items anywhere on the trail. If you produce trash while away from an aid station, and have already passed the trash box, please carry the trash with you until the next aid station.